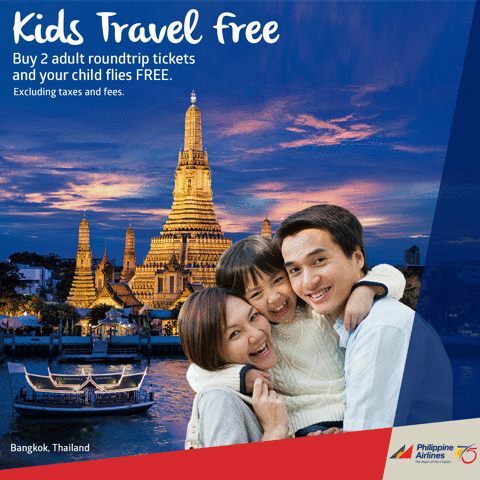 Philippine Airlines Promo 2019 - 2020: Promo is for Kids Only! 1. Valid for sales in the Philippines only. 3. Passengers must purchase 2 Regular Economy Tickets for travel within the specified travel period. Subject to blackout dates specified above. Free ticket for web purchases can be claimed at any PAL ticket office. Tickets must be exchanged within the promo period. 4. Travel must be completed by September 30, 2017. 5. No-show fee is USD 75. 8. All three (3) passengers must travel together both ways. 9. Free child/infant fare applicable to passengers from 0 month to 11 years old. Child/Infant’s taxes and surcharges shall be borne by the passenger. Presentation of a valid passport is required. 10. All three (3) passengers must be rebooked at the same time. Reissuance should be equal or to a higher fare amount. Downgrading to lower fare not permitted. Upgrade to the next higher available fare is allowed subject to: USD 100 and applicable fare difference. 11. Mileage accrual per applicable fare brand applies. Free ticket does not earn miles. 12. Baggage Allowance - Fare is inclusive of 7-kg hand carried baggage and 30kg Free baggage allowance. 13. Philippine Travel Tax is applicable to Philippine passport holders, foreigners holding a Philippine resident visa, and foreign tourists or expatriates who have stayed in the Philippines for more than one year. CAB Routing No: 16-4980; CAB Approval No: 1742-11,S2016.